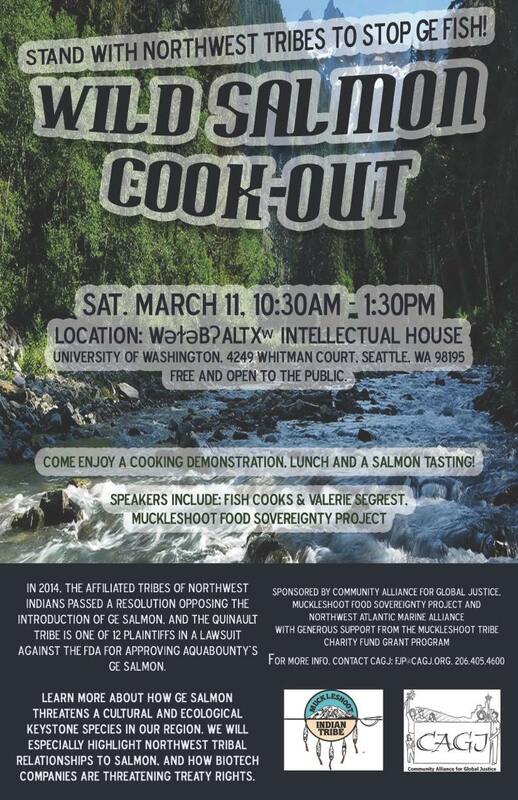 SAT March 11: Wild Salmon Cook-out, Stand With Northwest Tribes To Stop GE Fish! Location: wǝɫǝbʔaltxʷ – Intellectual House – On the University of Washington campus, 4249 Whitman Court, Seattle, WA 98195. See directions below! 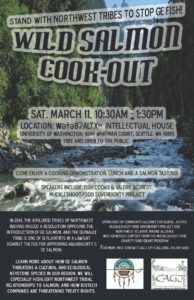 Join us for a salmon cook-out to stop genetically engineered fish! CAGJ is collaborating with the Muckleshoot Food Sovereignty Project and the Northwest Atlantic Marine Alliance to host a community gathering to learn more about how GE salmon threatens a cultural and ecological keystone species in our region. We will especially highlight Northwest tribal relationships to salmon, and how biotech companies are threatening treaty rights. In 2014, the Affiliated Tribes of Northwest Indians passed a resolution opposing the introduction of GE salmon, and the Quinault Tribe is one of 12 plaintiffs in a lawsuit against the FDA for approving AquaBounty’s GE salmon. Sponsored by Community Alliance for Global Justice, Muckleshoot Food Sovereignty Project and Northwest Atlantic Marine Alliance, with generous support from the Muckleshoot Tribe Charity Fund Grant Program. This event is FREE and open to the public. The venue is wheelchair accessible. Volunteer the day-of of the event! Help us publicize! Share the Facebook Event. For more info, contact CAGJ: fjp@cagj.org, 205-405-4600. Intellectual House is located on the NE side of the University of WA Campus, at the intersection of E Stevens Way NE and Whitman Court, NE of Red Square, Kane Hall and the Quad. If you are driving, there are several parking lots nearby. 1 Cross the skybridge over 15th Ave NE and continue towards Red Square. 2 Cross Red Square towards Suzallo Library (large gothic building), take a left towards the “quad”, a large rectangular courtyard surrounded by buildings. 3 Continue walking east through the quad, and climb the stairs at far end of the quad. 4 Take the path on the right leading to the road, E Stevens Way NE. 5 When you reach the road, you will see Intellectual House across the street. 1 Cross Montlake Blvd NE and Pacific Avenue via the skybridge. 2 Walk towards UW, cross the Burke Gilman trail, and follow pathway towards the center of campus. 3 Turn right onto the first road, W Stevens Way NE. 4 Continue walking along that road until you reach a 3-way intersection with Whitman Ct, where the Intellectual House is located. Enter UW Campus from either the entrance on NE 45th St, or off 15th Ave NE at NE Campus Pkwy. Drive to the toll-booth, and tell them that you are going to the Intellectual House and need parking. They will direct you to closest lot and give you a map. Posted in Events, Food Justice Blog Posts, News, Slider, Uncategorized.